A sawhorse is the kind of item you probably don’t think too much about in your day to day life. That is, until you need one. While sawhorses are used for sawing wood, they can do much more than that. With a little creativity, sawhorses can be though of more like a temporary workstations for various projects (Source). For professionals in construction and refurbishment, or simply for home maintenance and repair, these humble devices can be essential. Saw horses might seem simple on the surface. Four wooden legs and a narrow horizontal beam are all that’s required at the simplest level. If you want to get the best production of your table saw, you need to have the best gear. And modern technology has changed the way sawhorses look and operate in a number of ways. So if you want to find the best saw horse you can buy, read on. We’ll break down the market leaders before finding the best sawhorse money can buy right now. 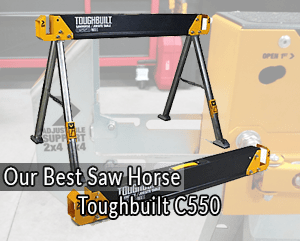 This folding sawhorse model from Toughbuilt is one of the most popular horses out there. It’s not hard to see why. The solid steel construction of this sawhorse makes it capable of handling an impressive 1100lbs of eight, or 2200lbs on a set of two. The zinc-plated steel resists corrosion, and the pivoting feet help to get this sawhorse set up so that it’s perfectly level, even if the surface it’s on is not. Another cool feature of this horse is the material support pegs. These pegs allow for the upright storage of materials and make cutting awkward objects much easier. 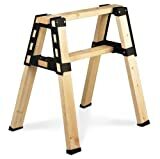 The folding legs of this sawhorse make it easy to both store and transport. It features a carrying handle to make transportation easier. 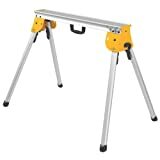 This feature-packed sawhorse also comes with 2×4 arms which can be used to turn two of these into a rectangular work table via the simple addition of some lumber. It’s a simple idea, but one that adds a great deal of usefulness to this already very practical design. 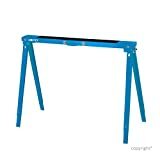 This metal sawhorse offers a great combination of portability with durability. It’s rugged enough for daily professional use. But its folding legs make it suitable for the home user too, who can store it out of the way when not needed. Nothing beats the durability of steel. But when weight is a factor, you may be better off considering lighter materials. This sawhorse from Stanley isn’t going to last as long as the Toughbuilt model. But the thick molded plastic is designed to be durable while still remaining lightweight. A pair of these sawhorses weighs 22lbs, whereas a couple of the Toughbuilt model is close to twice that. Furthermore, while these plastic sawhorses can’t hold the weight of sturdier metal models, the load capacity of 1000lbs per pair is nothing to be sneezed at. 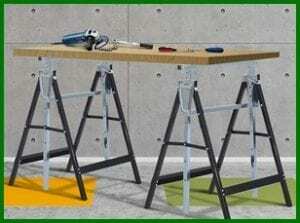 A folding tool shelf at the bottom of the legs of this sawhorse adds to the stability of the device as well as allowing for tools to be kept within reach while working. But the best feature of this sawhorse is its ability to fold completely flat. 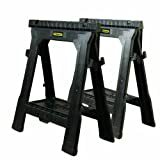 For someone who only occasionally needs to use a set of sawhorses, or for professionals who are often moving their equipment around, these sawhorses can be invaluable for light to medium duty work. 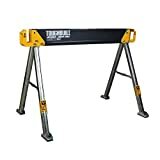 Rather than a mere sawhorse, Dewalt refer to this item as a heavy-duty work stand. There’s no doubt that the construction is solid. The metal frame is incredibly sturdy, with each horse able to support 1000lbs at a time. Although the construction is all metal, this sawhorse is made of aluminum rather than steel. This sacrifices some long-term durability for significant gains in portability. Sturdy as it is, this sawhorse is far lighter than equivalent models made of steel. As a bonus, aluminum is impervious to rust. The legs of this sawhorse fold away for ease of transportation and storage. When needed, the legs fold out quickly and are locked in place by the use of a special lever. This ensures the horse won’t collapse during use. Dewalt are already a respected name in tools, and it’s no surprise that this work stand meets the same high-quality standards set by other Dewalt tools. A standout feature is the ability to use this as a stand for a Dewalt miter saw via the use of special attachments. Dewalt’s offering is more than a simple sawhorse. Given its cost, durability, and customization options, this sawhorse is intended more for the professional market, and has the build quality one would expect for such heavy duty usage. The HICO sawhorse’s simple design hides some features that make it an attractive offering for home and professional users. Metal construction makes this a durable and long-lasting piece of equipment. The legs fold away to help transport or store the sawhorse. The HICO also features pre-drilled mounting holes that allow a set of these sawhorses to be turned into a table with the addition of a sheet of wood. Don’t let the minimalist design fool you. 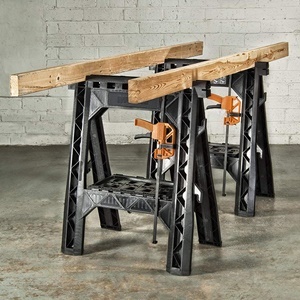 These sawhorses are capable of supporting 1200lbs, thanks to a cross brace on each side. And the top of the horse is protected by a non-slip rubber mat to prevent accidents from ruining your work or causing injury. But one of the best features of the HICO sawhorse is its adjustable height. The metal legs have five different height settings, from 25 inches to 40 inches. Not only does this allow a range of different jobs to be performed on a single set of horses; it also helps make use comfortable for people of different heights. When used correctly, this sawhorse should give years of service. It’s important though to ensure when adjusting the height of the sawhorse that it remains level. It’s easy to mismatch the holes and end up with a sawhorse that sits at an angle. Sawhorses don’t come much more basic than this. In fact, as you’ll discover when you pick up the box this item comes in, this isn’t really a sawhorse at all. Instead, this item is a pair of brackets that allow you to build your own sawhorse. This may sound basic, and it is. But there are certain advantages to going about things this way. One is the cost. With these brackets and some lengths of 2×4, you can build a sawhorse for far less than buying one premade. If price is a major factor in your purchasing decision, this might be your best option. But another advantage to the DIY option is that you can make a sawhorse to suit your needs exactly. Height, length, and width all depend on the lumber you use. 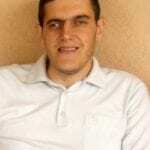 For special projects, or for the very tall or very short, this customization ability is very useful. The brackets allow for two levels, making a very sturdy sawhorse when assembled. While the brackets themselves are plastic, the sawhorse you make with them can hold up to 2000lbs. There’s more to a sawhorse than just a sturdy pair of legs. When looking to buy a sawhorse, you need to think carefully about what you need from it and how much you’re willing to spend. Remember, quality doesn’t come cheap. Plastic, metal or wood? Saw horses come in a variety of materials, with a similar range of price points. And every option has its pros and cons. For instance, if you will be moving your sawhorse around to various job sites, the light weight of plastic will definitely appeal. On the other hand, if you want a piece of equipment that will stay in one place and last for years, metal would be the way to go. nice feature of the wooden sawhorse is its ability to take a cut if you slip up during sawing. A metal sawhorse could damage the teeth of your saw if you cut into it, but wood is less likely to cause damage. Some of the better saw horses out there include a shelf to hold tools while you work. This can be a handy feature to have, allowing you to keep what you need nearby as you work. It can also improve the stability of the sawhorse. Some saw horses allow you to raise or lower the work area to accommodate different objects needing to be cut. This can also be helpful if people of varying heights will be using your sawhorse. Just make sure that the work surface remains level once you’ve finished adjusting the height. You don’t want to make uneven cuts due to a tilted sawhorse. If portability is important to you, a folding sawhorse can save precious cargo space and be easier to move around than a non-folding one. But be sure to check, if you choose the folding option, how much weight the horse can take. Folding designs are by definition less sturdy than stationary ones. The best sawhorse available is the one that fits your specific needs. As is the case with any tool, what features you require will depend on your intended use, as well as your budget. If you have a specific project in mind and need a non-standard size sawhorse, simple brackets that allow you to make your own sawhorse could be the best option. On the other hand, if you use your sawhorses on a regular basis, you need something durable and versatile that can perform multiple functions. Portability could be a make-or-break issue, or it may not matter to you at all. The same applies to some of the other features on the more professionally focused models. Before making your decision, thank carefully about where and how and how often you will be using your sawhorse. Only then can you make an informed choice as to which model is best for you. I completely agree with your final take, because I have seen SO MANY PEOPLE asking which one is the best! Just like in any profession, there’s nothing best until you know what you need done. So it’s more important to know what you’re trying to accomplish, your skills and then go find the right tools for it. Great tools pick!